Vibcare Pharma Pvt. Ltd is a renowned PCD Pharma company based in India. The company offers fully integrated solutions in contract manufacturing and development. Since 2013, Vibcare Pharma has enhanced the health of the people through manufacturing high-grade generic products. They also offer pharma franchise programs to help create more business opportunities for pharmaceutical distributors in India. The company produces a wide variety of top quality healthcare products to both local and international markets. Their objective is to be a leader in the pharmaceutical industry who provides high standards of manufacture and cost-effective products. They have GMP certified facilities. Speaking about the third party manufacturing process, the Company Spokesperson said, "Third-party manufacturing is a process which begins by finalizing the order composition and quantity while adhering to the minimum order quantities for the composition. The next process is to raise a quotation including all the costs of the products, securities, packaging materials, and any other charges. For manufacturing to take place, relevant documents including the license and GST number is required. The product manufacturing process takes place through Good Manufacturing Practices before the products are delivered.â&#x20AC;? 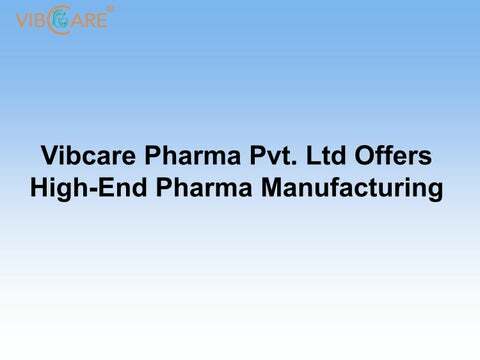 Vibcare Pharma is one of the top-rated pharma manufacturing companies in India. The company offers PCD pharma franchise and PCD pharma services. It has five divisions with more than 500 products in the market. They provide a wide selection of soft gel capsules, tablets, injectables, topical gels, oils creams, syrups, lotions, sachets, and drops, among others. They have a customer support team that is dedicated to serving all their customers' needs. Vibcare Pharma provides promotional materials including prescription pads, visual aid, reminder cards, gifts, keychain and more at no added cost. Explaining how to start a pharma franchise, the Company Spokesperson continued, â&#x20AC;&#x153;Pharma franchise is when one is authorized to use a brand name, proprietary knowledge, trademark, products and more of a pharmaceutical company by a distributor or individual. The authorization helps the franchised to set up their business under the name of the franchisor. The pharmaceutical companies give the distributors' monopoly rights to use their brand name in a specific region. The distributors then attain a drug license from the relevant authorities to operate the business. With promotional material provided by the franchisor, the distributor can market the products." Vibcare Pharma is one of the fastest growing pharma manufacturing companies in India that is devoted to high-quality healthcare. The company designs, manufactures and markets pharmaceutical products in local, African, South Asian and CIS markets at highly competitive rates. They have a PCD pharma program that is well designed to offer PCD franchise to their clients. While providing quality and competitively priced products to its clients, Vibcare Pharma also ensures to support them with dedicated customer support. Their integrated contract manufacturing and development solutions include early development to high volume commercial manufacturing and packaging.